This post was originally written during my 2 1/2 year tenure as a blogger for Health Goes Strong. The site was deactivated in July 2013, but you can read blog here. Barbecues are not known for their healthy side dishes, but there are some exceptions. The best of the lot feature seasonal vegetables that are minimally dressed — meaning not wearing mayonnaise like a winter coat. 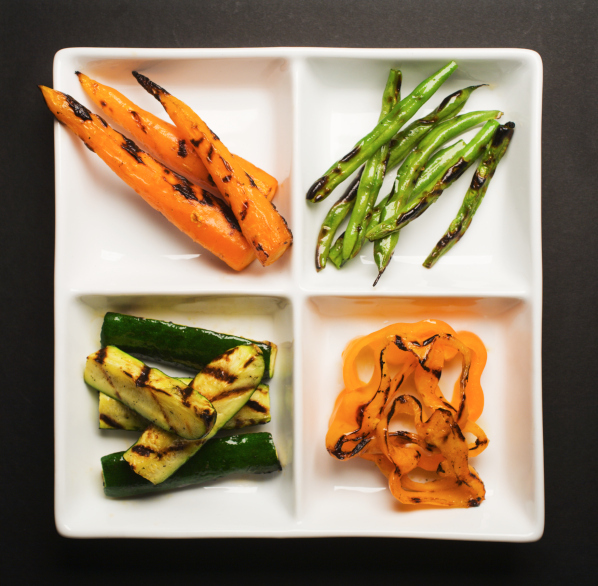 Look for these sides to fill your paper plate, or add to the grill to make your own healthy sides. 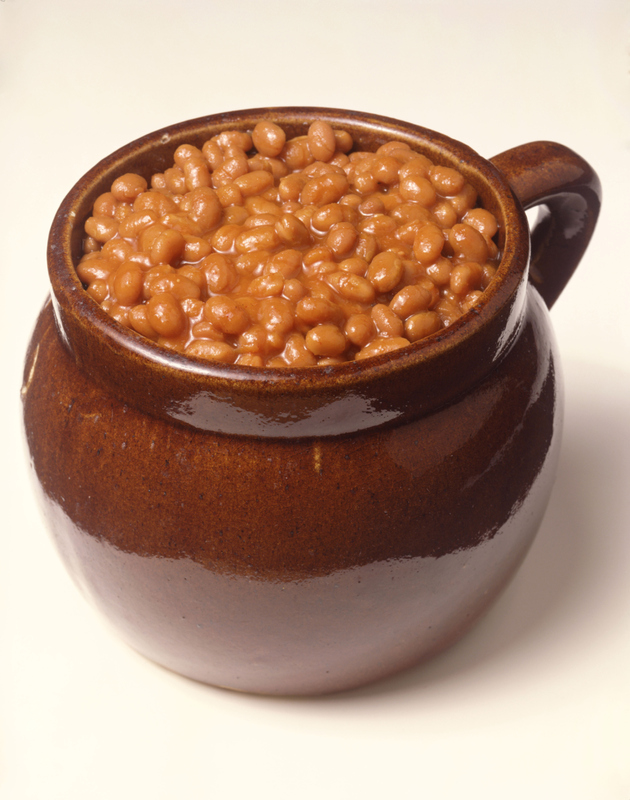 Healthy Side Dishes: Baked Beans: Yes, beans are vegetables! They’re also a good source of protein, but much lower in fat than any meat on the grill, so they can be a side dish that replaces the beef, pork, or poultry on the menu. 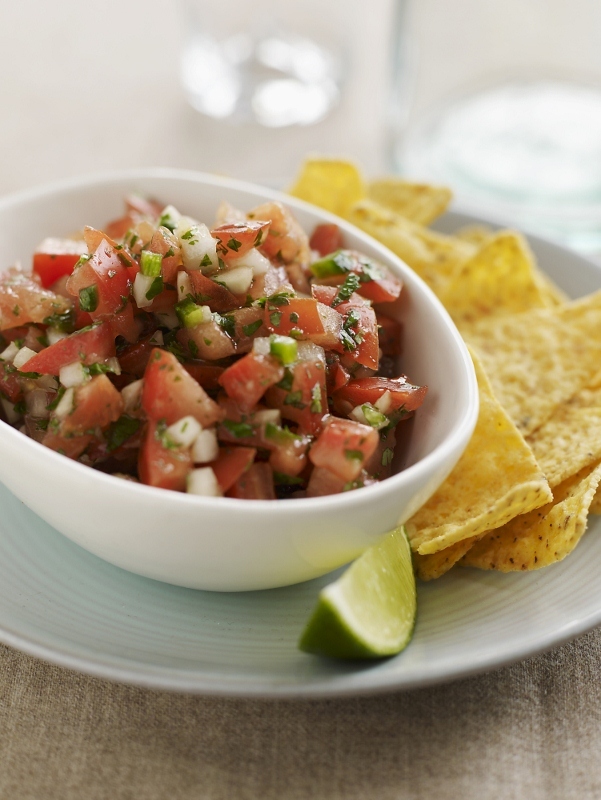 Healthy Side Dishes: Salsa: Typically used as a dip for greasy chips, salsa is at its best when paired with barbecued meats and fish since it means “sauce.” Skip the chips and spoon it onto your plate to enjoy as a spicy side dish. Healthy Side Dishes: Grilled Corn: Brush it with olive oil before grilling to savor the toasty corn flavor without any butter. The extra time it takes to eat it off the cob helps you feel more satisfied by the time you’re done. Healthy Side Dishes: Garnishes & Condiments: Make your own salad from the burger toppings and garnishes found on the other salad platters. 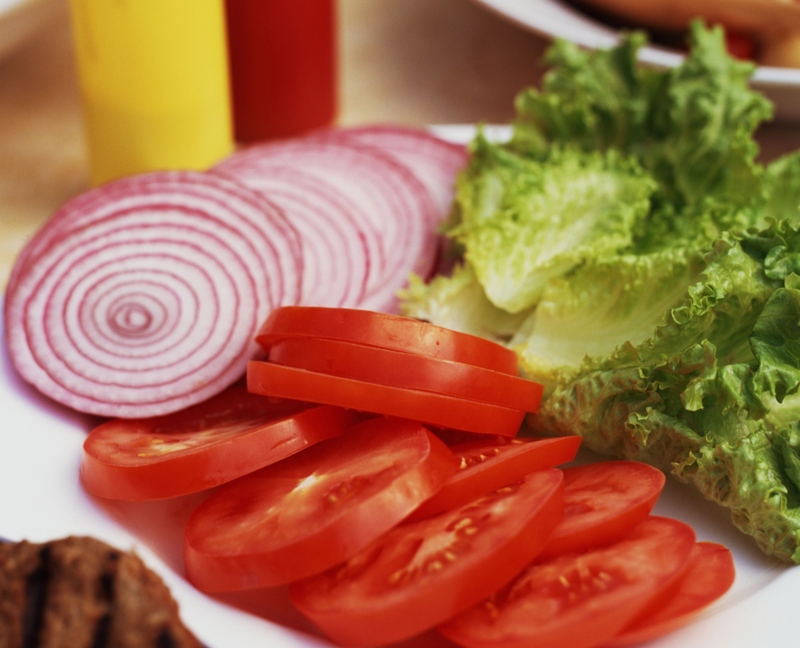 Make a base with lettuce and tomato, then pile on the radishes roses, pepper rings, carrot curls and cucumber slices. 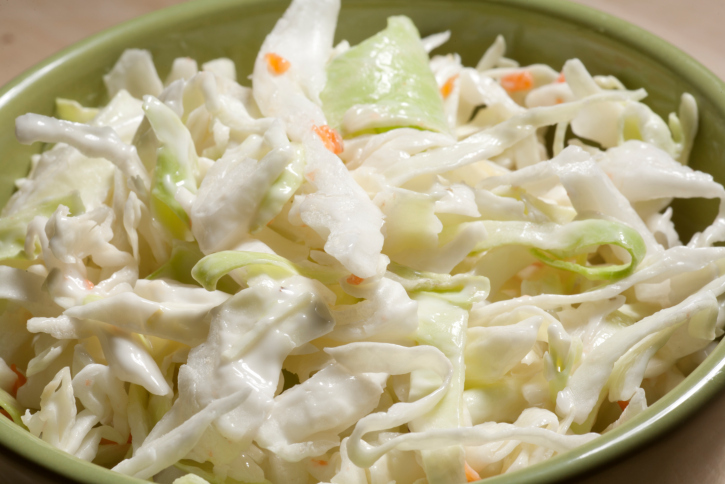 Healthy Side Dishes: Coleslaw: Crunchy raw cabbage beats potato and macaroni when sizing up the nutritional merits of the 3 most popular mayonnaise-coated salads. Serve yours with a slotted spoon to leave some of the dressing behind. Healthy Side Dishes: Grilled Crudité: Gather raw vegetables from the crudité and add to the grill for a flavorful side that needs no dip. Try carrot sticks, zucchini strips, green beans, asparagus, mushrooms and more for a flavorful side dish. Healthy Side Dishes: Roasted Peppers: Salvage some peppers before they end up tossed with the sausage and turn them into a side dish. The more colorful the better. 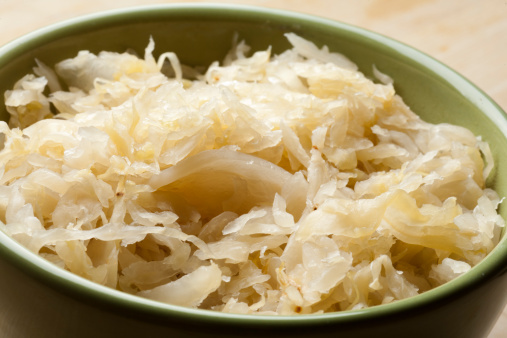 Healthy Side Dishes: Sauerkraut: This pickled cabbage can be eaten hot or cold and deserves to be more than a frankfurter topping with just 27 calories per cup. The high salt content isn’t for everyone, but can help replace sodium lost in sweat by those who are more active. There’s nothing better than visiting local farm markets to buy fresh produce. That is, unless you grow your own. I’m lucky enough to do both. Each summer I grow what I can in my backyard and shop from the back of pick-up trucks and simple road-side stands for the rest. If you’ve never shopped at a farmer’s market before, it’s time to start! Why Shop at Farm Markets? Buying fresh, seasonal and locally produced food has nutritional and environmental benefits and helps support the farmers in your area. Of course, you will still have to buy produce in your grocery store since no part of the country grows everything you may need – especially if you like bananas – but your first stop should be the farm stand. The U.S. Department of Agriculture has made it easy to find farm markets in every state. Just plug in your zip code on the Agriculture Marketing Service site to get market locations in your area and information about what’s in season and forms of payment accepted. If you prefer to buy organically grown produce you will find the prices much better than those charged in health food stores and supermarkets. Farms that have received organic certification will display a sign on their stand, but it’s worth asking the others. Since getting certified is a costly process, many farmers use organic growing methods and skip the certification. Check your calendar before arriving to have an idea of how many meals you’ll be shopping for in the coming week. Carry a cookbook to get recipe ideas for less familiar products. Be flexible with your menu plans, the market only carries what’s ripe and recently harvested. Ask the farmer to identify unfamiliar items and how to prepare them. They love to share ideas. Don’t forget some flowers for the table! Bring cash, preferably smaller bills. Tote your own bags for individual items and a strong satchel to put everything in. Use saved plastic baskets or other plastic containers with lids for delicate berries, mushrooms, cherry tomatoes. Put a cooler in the car if produce will be left in it for any length of time on hot days. Request “seconds,” the slightly bruised pieces that are fine for jams and pies. Farmers are happy to sell them for less. Arrive later in the day to get close-out deals. Buy fresh herbs to make pesto. Watch for my upcoming story on pick-your-own fruit and vegetable farms – the perfect combination of food and fitness in a fun afternoon! It’s Frozen Food Month: Got Vegetables? ONE OF THE BEST VALUES IN THE FROZEN FOOD SECTION OF YOUR GROCERY STORE IS THE VEGETABLES. What’s the one frozen food I always have on hand? Frozen vegetables! They are my go-to staple that allow me to prepare nutritious and varied meals no matter how sparse the rest of my pantry. Right now I have cubed butternut squash, petite peas, broccoli florets, edamame in the pod, and baby lima beans. I was first introduced to frozen vegetables as a child when my parents bought a chest freezer. Every three months a delivery of frozen food arrived on our back porch. The carefully labeled brown corrugated boxes packed in dry ice were filled with every cut of beef imaginable, cylinders of frozen orange juice concentrate, and tidy square boxes of frozen vegetables. My sisters and I had the privilege of taking turns to pick out what vegetable our family would have for dinner each night. Thus began my exposure to an international assortment of frozen vegetables that included everything from French cut green beans Brussels sprouts! What’s new in the frozen food aisle? If you think Americans don’t like frozen vegetables, think again. The freezer cases in grocery stores now devote as much space to vegetables as they do ice cream! Frozen vegetables are now available in single-serving containers and family-sized bags as well as those same tidy 10 ounce boxes. As if it weren’t convenient enough not having to clean, peel, or chop frozen vegetables, you can now also steam them right in the bag or box in your microwave oven. The assortment of individual vegetables has expanded beyond the classic green beans, carrots, peas, and corn, and so have the medleys. They come with embellishments, too, to win over the fussiest eaters. You can find frozen vegetables with butter, cheese, or teriyaki sauce, and creamed. Some are combined with rice, potatoes, or pasta while others just need the addition of chicken, beef or shrimp to make a complete meal. Why pick a frozen food over fresh? When it comes to vegetables, buying them frozen insures you are getting the best quality at the best price all year round. The varieties grown are selected for their flavor, not their durability, and can be harvested at their nutritional peak since they don’t have to withstand the long shipping and storage times necessary for fresh vegetables. And remember, the longer a fresh vegetable spends in your refrigerator, the less nutritious it is by the time you eat it. What frozen vegetables do you have in your freezer?